Shows how this foundational book foreshadows Christ, points to the new creation, and calls us to radical discipleship. Without Exodus, we have an impoverished understanding of the nature of God, the achievement of the cross, the triumph of the resurrection and the identity of God's people. 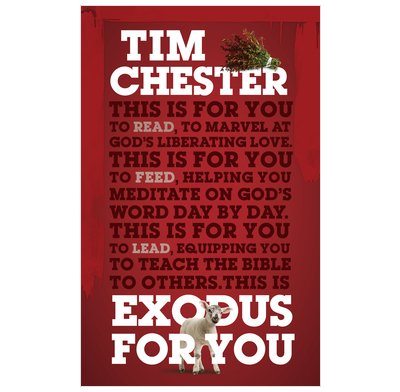 With his trademark Christ-centred clarity, Tim Chester walks readers through Exodus, making its great themes thrillingly clear to those new to the book, and unearthing wonderful new surprises for those familiar with it. You can read through this book as a normal book… work through it as part of your daily Bible-reading routine using the questions for reflection at the end of each chapter… or use it to help you teach this book of the Bible, whether in small groups or from the pulpit. 2. What’s in a Name? With Tim Chester, one is always sure to get great expository and applicatory content, but I’m particularly enjoying this book. Useful both for personal devotion or sermon preparation! Really enjoying it in my morning devotions as I see how the whole story of the exodus ties into the gospel fulfilled in Jesus Christ. A great piece of work as ever from Chester. This book helped me to understand the links between the book of Exodus and what Jesus has done for me in his life and in his death. It is clearly written in chapters which are not too long and which carefully relate to each chapter of Exodus as I read through it. Tim Chester also uses some very down to earth illustrations and stories from real contemporary life. I am looking forward to sharing this book with a small Bible Study House Group to which I belong and believe it will stimulate discussion as well as helping people's daily experience.